Industrial axial fan FDA-2E-300B with grille and mounting frame, diameter of the fan blade Ф300 mm, supply voltage 220​​ VAC. Rated power 195 W and flow rate 3250 m3/h. 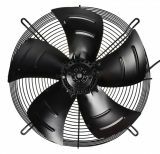 Axial fans are the most common type of fans and are widely used in both the household and the industry. Among their advantages are high flow, low noise and reliability. The fan is not allowed to operate under vacuum conditions (for example, the blower can take air out of a room that can not get enough air otherwise). This will result in insufficient airflow to cool the motor and the fan will be damaged. It is possible to adjust the fan speed by means of a frequency inverter or by phase adjustment with a reduction of the speed up to 75%. The fan can not be powered by a DC / AC inverter with a modified sinewave - this will cause it to malfunction.